Storytelling is quite possibly the most important element in a strong work of art. Finding a way to evoke emotion through story can take on various forms. But how do you tell a story with no words? Solid physical technique. 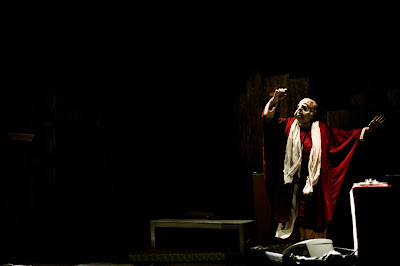 In The Krumples Theatre Company’s Go To Sleep, Goddamnit!, a small provincial church gets a wake up call as the world keeps spinning as times change and beliefs progress. International theater company The Krumples bring their movement piece Go To Sleep, Goddamnit! to The Tank. Without a single spoken world, the ensemble relies an stunning masks and incredible physical work to tell the story of a priest’s existential crisis and the three drastically different nuns and their view of the world. The Krumples’ stunner is an intricate and captivating exploration of Evolution and progress of faith today. By simply using physical comedy, movement, props, and sound, a cohesive story was portrayed. Though the piece starts off a bit slow, once the comedy picks up steam and the characters establish themselves, the audience is in the palm of their hand. What sets this piece apart is their strong sense of reliance. A story without words relies heavily on a great pitch. If you are unable to illuminate the plot, the entire piece will fall flat. Fortunately, The Krumples illuminated with ease. The ensemble of four, made of Jo Even Bjorke, Jon Levin, Oda Kirkebo Nyflott, and Vincent Vernerie brought life to the stage. They were a cohesive unit that made everything happen, literally. The Krumples themselves took on the roles of writers and directors. There are times when having so many cooks in the kitchen with an abundance of roles can hinder a production, this was not the case. Everything was cohesive from start to finish. From a design aspect, everything was kept clean and precise. Very simple wood set that simply evokes the interior of a church. The sound, when used, was specific and added a nice layer to the wordless world of the play. The lighting design by Jamie Steffen was quite good, especially during the more theatrical moments. Go To Sleep, Goddmanit! is like no other. Movement based theater can be a hard sell, but when it’s good, words don’t mean a thing. Get yourself to The Tank and see for yourself.